The vocal department from this band has always been a problem. Roberto Sorglon was really poor and he is this time associated with Annalisa Malvasio who already sung in one song on their prior album. This is for the best of this work, because she is more involved and to be honest, Roberto also sounds better here (but it was easy). This being said, this album is a suite of short pieces which leaves me a bit hungry. The first A song (from a total of three) features a fine vocal from Annalisa. The tone is quite usual here: her voice is truly powerful on this jazzy piano oriented song. But it sounds as unfinished, cut down. Le Refuge Du Temps starts with a fine and very high pitched vocalize part and switches to some neo- prog flavour (it won't be the sole example). The highlight is the work from Annalisa. There are lots of classical touches (there is a string quartet invited as guests) like during A (the second one) but not only. When you add this feature to the fact that Annalisa has a brilliant but opera oriented voice, it only completes the picture (Le Refuge Du Temps or the short The Voice of the Highland for example). 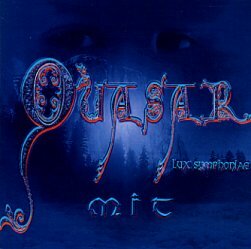 My favourite track is also one of the longest from Mit: The Search holds all the elements of a neo- symphonic song: strong synths with moving and at times furious guitar. It includes again English lyrics which is a tradition for this Italian band. As usual, some instrumental passages are brilliant like in The Lord Of Fire but these can't raise the level of this album to a four star rating as far as I am concerned. This album is fine to listen to; there aren't any annoying parts (which was the case in their previous albums, but it was due to the vocals). It is an album that doesn't captivate though: you listen to it, it is fine but you won't remember any great piece of music. As soon as it ends, it is already almost forgotten. My favourite instrumental is the sweet and melodic Flowing down the River but The Silent Breath is pleasant as well: a smooth blend of acoustic guitar and strings. A bit sad, perhaps. The music represented during Mit is a very soft symphonic one. Even if Glance Of Giada is a bit more upbeat. The synthesizers are providing some neo-prog touches to this longer than average tune (over seven minutes). This album is a good companion for a moment of tranquillity during your week-end. Quite alright actually on this Sunday morning.